Business Transactions | Fournier Law Firm, Ltd.
With Fournier Law Firm, Ltd. on your side, you never need to approach important business transactions alone. Our experienced team of Illinois business attorneys can advise you throughout all your essential business dealings, including formation of corporations and LLCs, contract drafting and negotiation, and buying or selling a business. Transferring a business from one owner to another often requires ongoing negotiations and the preparation of multiple agreements and transactional documents before a deal can close. By working with our skilled business attorneys during every stage of the business transaction from performing due diligence to negotiating the sales contract, you can protect your interests while making the deal you desire. Gain the confidence you need to buy or sell a business. The business attorneys at Fournier Law Firm, Ltd. can help. Call (630) 792-1000 today to schedule a free consultation, or complete our Online Contact Form to have a member of our staff contact you. 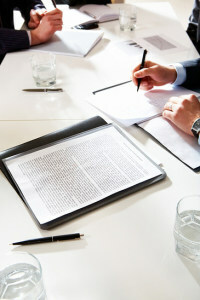 Our attorneys know how important each word is in a business agreement. Whether we are helping you draft an original contract or negotiating changes in the terms of an agreement prepared by another party, we can counsel you on the language that needs to be included to achieve your goals. A strong sales contract offers assurances to your customers regarding the terms of their business transactions with your company. It also provides important protections that limit your company’s liability. Our business attorneys can draft a broad sales contract that covers most of your company’s transactions or create specialized contracts for specific accounts. Make sure you understand exactly what you’re getting into before you sign a contract for financing with a lender. Our business attorneys understand the intricacies of both traditional and alternative financing options and will negotiate on your behalf for the most favorable terms. If your business requires you to enter into a lease agreement or to buy or sell property, our attorneys can help draft or review the property contract to limit your liability exposure and protect your business interests. Having a strong contract in place with each of your vendors is essential to protecting the interests of everyone involved. Our attorneys can draft or review all your vendor contracts to make sure they achieve your desired business goals. Let us focus on the fine print of your business contracts so you can focus on your business. Call (630) 792-1000 to learn how Fournier Law Firm, Ltd. can assist with all your business transactions. You can also complete our Online Contact Form to have a member of our staff contact you. Forming a new business is an exciting venture. Our attorneys can help you get it started right by advising you on the best way to structure the business to minimize your individual liability and protect your personal assets. Whether you want to do business as a corporation, a limited liability company, a general or limited partnership, or a sole proprietorship, Fournier Law Firm, Ltd. can help you form the business that will best serve your needs. We can also assure that you comply with all of the regulatory requirements of Illinois law, including the preparation of required annual reports and corporate minutes. Not sure which business structure is best for your company? We can help you explore your options. Call (630) 792-1000 to today for a free, no-hassle consultation. You can also complete our Online Contact Form to have a member of our staff contact you.